There are many ways to experience Victoria Falls. The most conventional way is to access the Mosi-Oa-Tunya National Park and take the footpath that runs along the opposing side of the gorge (crossing a fun swing-bridge along the way), but for the more adventurous – how about taking a helicopter or microlight flight for an aerial perspective, or even view it upside down from the end of a bungee cord? Sound thrilling, but few things compare to actually sitting on the top of ‘The Smoke that Thunders’, with the rushing power of the Zambezi River all around you, looking over the edge of this 108-metre-drop . Many people already know about Devil’s Pool, but have you heard of Angel’s Pool? Here we give you the low-down on which pool to visit and when, but don’t be fooled into thinking that Angel’s Pool is the tamer option… she’s not as innocent as she sounds! 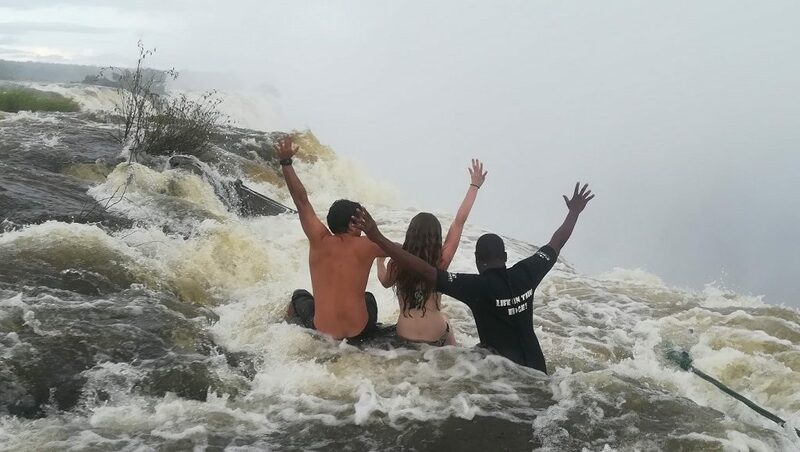 Usually open between August and January (depending on the water level), the aptly named Devil’s Pool is a natural infinity pool that’s only accessible from Livingstone Island – an island that sits in the centre of the river, teetering on the edge of the falls. After a short boat ride to the island, dare devils can take a short and rocky walk to the pool where they can take a dip and a peek over the edge. For those that need reassurance, Livingstone Island tours are operated by professional and experienced guides through Tongabezi Lodge. Being open predominantly during the drier months Devil’s Pool allows you to get even closer to the edge than Angel’s Pool. Check out this video to get your heart pumping. As sweet as she sounds, Angel’s Pool is by no means the more reserved option. Generally open when Devil’s Pool isn’t, the best time to pop in at Angel’s Pool is just before the water levels get too high (mid-March to mid-June). This is right when the falls are at their most impressive and you can experience the full force of the mighty Zambezi River. To access this pool you will also have to access Livingstone Island. Except for when Livingstone Island is closed due to the high-water levels (mid-March to mid-June) there is a pool for you!